A design is an arrangement or organization of items. The elements of design are the basic components of a two- or three-dimensional arrangement. Any visual work can be dissected to identify the five elements of design. These five elements are integral to every type of design, including designs of textiles and clothing. There are several different types of lines, including vertical, horizontal and diagonal. Lines can be thick or thin, zigzag or jagged, straight, curved or wavy. In apparel design, lines can be a seam or embroidery or be used to describe how the garment fits the body. In textile design, lines can a pattern on fabric, such as a stripe, or can be the weave of a piece of cloth. Every type of textile and clothing design starts with a line. Shape is a very important element of design. Shapes are formed by connecting different types of lines. In apparel design, the term "shape" applies to the way the garment fits. Bell-bottom pants, a-line skirts and trapeze tops are all examples of shapes in apparel design. Shape can also be achieved by folding and stitching fabric, like a pleat or a dart. In textile design, shape applies to patterns on fabric. 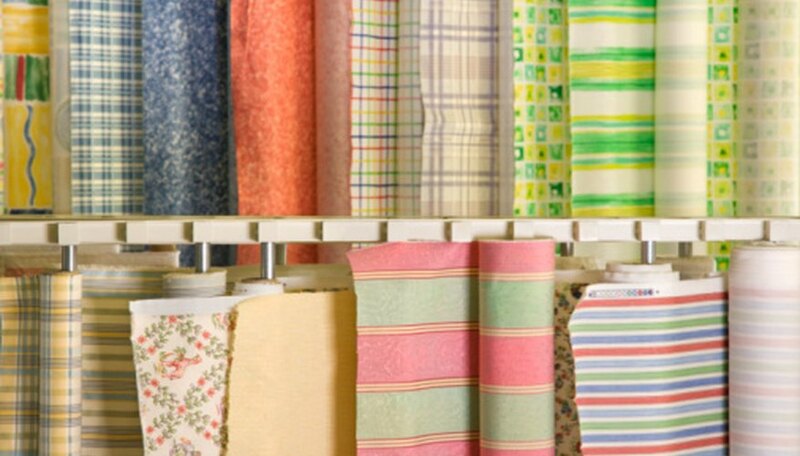 Polka-dot, hound's tooth and plaid are all examples of shapes in fabric. Color is another element of design. Various colors, shades and hues evoke different emotions and moods. Certain colors, such as blue and orange, are complimentary on the color well. Choice of color in apparel design is important to convey the mood or theme of a designer's collection. In textile design, color is one of the most important elements, as it is one of the first decisions a textile designer makes. A textile designer, like an apparel designer, considers color and color combinations to evoke a feeling or mood from his design. Texture is just as important in clothing design as it is in textile design. When designing fabric, a textile designer strives to create a certain weight and hand, or texture, to the fabric. Examples of fabric textures are boucle wool, corduroy, denim and satin. A clothing designer certainly takes fabric textures into consideration when designing a garment. Satin hangs differently on the body than corduroy does. The texture of fabric also determines what fabric would be a suitable match for certain garments. Space is the final element of design. A textile designer considers positive and negative space in her fabric pattern. The clothing designer considers how the garment occupies a space. A couture dress designer or a wedding dress designer designs a gown based on how it would look on a runway, on a red carpet or walking down an aisle.